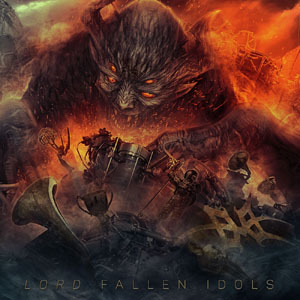 Australian metallers LORD have revealed the cover art and track listing of their forthcoming album Fallen Idols and released a video clip for the opening track “United (Welcome Back)”. Watch the video now on KNAC.COM HERE. "Nod to the Old School"
Fallen Idols is slated for release at the end of April. LORD is essentially a continuation of DUNGEON, one of Australia's longest-running heavy metal bands, with over a dozen releases so far. Their most recent output was a live album and full length concert video from their ProgPower USA appearance in 2016.